Synopsis: On the day of the NFL Draft, general manager Sonny Weaver (Kevin Costner) has the opportunity to save football in Cleveland when he trades for the number one pick. He must quickly decide what he’s willing to sacrifice in pursuit of perfection as the lines between his personal and professional life become blurred on a life-changing day for a few hundred young men with dreams of playing in the NFL. Draft Day, as the name suggests, uses that all-important NFL business day as its main point of focus. 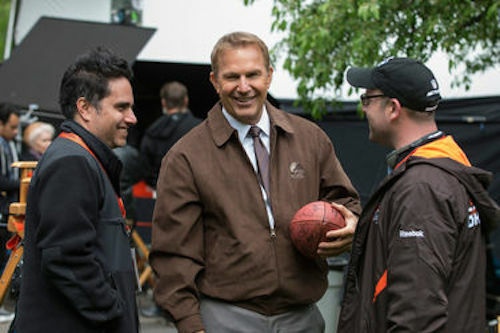 It imagines an alternate version of the NFL where Cleveland Browns General Manager Sonny Weaver Jr. (Jack Ryan: Shadow Recruit‘s Kevin Costner) has just made a big move on draft day in the hopes of pleasing his overzealous owner, but his move may not have been the right one. As a result, Weaver frantically tries to turn what might seem like a mistake into a positive, while juggling various personal and professional problems along the way. While the staging of Draft Day during the actual NFL draft suggests a level of realism, the film itself struggles to portray the event in any sort of believable way. Its ticking clock set-up and constant telephone conversations suggest urgency, but the side stories come across as little more than B-movie drama. Even though the NFL has always been known to be a cutthroat business focused on success, Draft Day paints a picture contrary to that, where the good guys win out and everyone gets their moment. Draft Day does at times feel like an authentic portrait of that major NFL business day. The brisk pacing of the film, the interactions between various NFL personnel (coaches, GM’s, owners, players), and the way Weaver is pulled in a thousand different directions all add back to the realism. Costner is excellent as the grizzled Browns GM; he plays Weaver as a grumpy, yet charming, executive forced to please a dozen different masters, while also keeping himself happy. 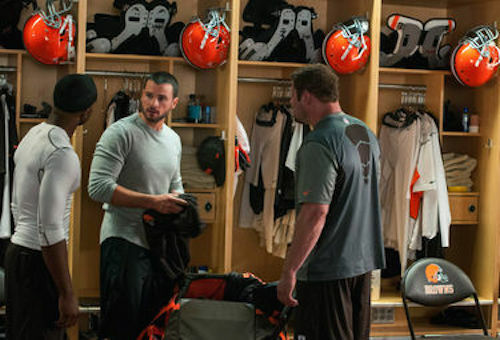 The film also does a great job of setting up the stakes of the NFL draft, both for the players and the teams. In fact, this might be one of the best, if not the only, true to life portrayal of how the NFL draft works, at least from an outsider’s perspective. You come to understand that a lot more goes into picking a player to join a team than simply who best suits your needs. Draft Day does its best not to fake anything, shooting in actual Radio City Music Hall and using real NFL analysts for color commentary. Once you dig a little deeper beneath the veil of realism, Draft Day starts to fall apart at the seams. What might have, at a glance, seemed like an authentic portrait instead comes across as a dramatized oversimplification. The fact that Weaver has to juggle not just an important draft pick, but a girlfriend (Butter‘s Jennifer Garner) who has just recently discovered she’s pregnant, an obstinate coach (The Amazing Spider-Man‘s Denis Leary), and, among other things, a bumbling intern (Beneath‘s Griffin Newman) suggests Draft Day wanted to be as palatable as possible. This is a film that wants to tick all the boxes – from comic relief to love story – and by its ending that becomes crystal clear. One particularly odd choice that, coincidentally, reflects the film’s overall uneven tone is the use of split screen. Since a lot of the high drama of Draft Day is reduced to tense phone calls between fellow NFL executives, the film tries its best to give those scenes a dynamic feel by using split screen in a variety of ways. Rather than the static 50/50 split of your traditional phone conversation, director Ivan Reitman (No Strings Attached) smartly lets the pace of the scene dictate the ebb and flow of the screen sharing. In some cases that means a character’s profile will spill into the other half of the screen, even overlapping the solid black border, or in others a character might slide across the screen as they are themselves in motion. It’s certainly a strange and oftentimes distracting choice, but it’s better than an endless series of generic phone conversations. To fault Draft Day for its overly saccharine resolution might not be fair, but neither is the NFL. It’s a cutthroat establishment where happy endings are few and far between, and every business decision is pre-meditated. Draft Day dips its toes into that pool of pessimism, but it never fully submerges itself. Sonny Weaver is seen struggling to make the right decision, but the fact that every conflict in his life feels like a binary choice lightens the intrigue. Everything is too cookie cutter perfect. The film’s stellar cast, especially Costner and Garner, do their best to elevate the material, bringing gravitas to every scene, but at the end of the day the film misses the mark. It wants to have its cake, in the form of an authentic draft day depiction; and eat it too, in the form of a high-drama fluff piece. Had Draft Day leaned a little further in one direction it likely would have been more successful. Instead, it’s simply a passable drama with some solid performances. 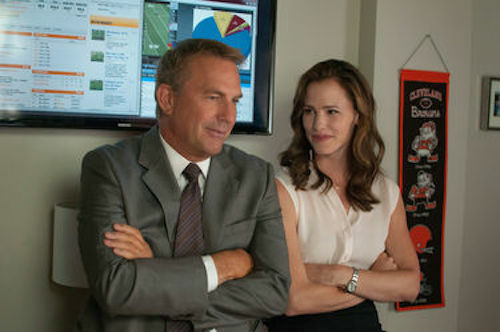 Draft Day simply feels like a movie that uses the draft as the impetus for generic and trite drama. It could have been bold, but it ends up bland. It’s not entirely clear how much familiarity screenwriters Scott Rothman and Rajiv Joseph have with the NFL or the draft day process. What is clear is the type of film the two wanted to make. They couldn’t care less about authenticity or realism within the depiction of the NFL, but rather they use the day as a platform for generic drama. In a way it seems like the writers took the most superficial approach to the core story possible – the NFL draft – choosing to add elements that work for the story, and overlooking everything else. Pleasing a crowd is one thing, but contorting the film’s story and an actual event to fit that goal is poor storytelling. To be fair, the script does have some very lively characters, even if a few are thinly drawn. Similarly, the dialogue and structure of the film is lean and focused, with few unnecessary detours. It’s just a shame that the script devolves so quickly into this neat and tidy checklist where everybody gets a happy ending.